Are there used car dealerships in Terre Haute that offer a great selection of used trucks for sale in Indiana? Will I find used car dealerships with used trucks for sale near me in the style that I need with the options that I want? Will Terre Haute used car dealerships have used 4x4 trucks for sale near me that are within my budget? If you find yourself asking any of these questions and you live in or near Terre Haute, Indiana, then make your way over to Terre Haute Auto. We are committed to providing Terre Haute drivers like you with exceptional customer service and outstanding vehicles. Our friendly and knowledgeable sales team members are happy to answer any questions you may have on our used trucks for sale in Indiana, including used 4x4 trucks for sale, and take you out for a test drive to ensure that it fits your wants and needs. We have many makes, models, and body styles of used trucks for sale in Indiana, including used Chevy 4x4 trucks, to choose from at Terre Haute Auto. Whether you are looking for used 4x4 trucks for sale in Indiana because you need it for household projects, safety, for work, or any other number of reasons, Terre Haute Auto has many different used 4x4 trucks for sale to meet those needs. Like used Chevy 4x4 trucks for sale. Used Chevy 4x4 trucks for sale have an extra degree of ruggedness for traveling over rough terrain. Used Chevy 4x4 trucks for sale near me also have added power compared to 4x2 trucks. Which in turn means more torque, a bigger payload, and better towing capacity. When you want a used truck for sale that owns towing, trailering ability and payload capacity you need to check out the used Chevy 4x4 truck for sale near me at Terre Haute Auto. Used Chevy 4x4 trucks for sale which are known for being reliable and hardworking. Like the used Chevrolet Silverado 1500 LTZ for sale. 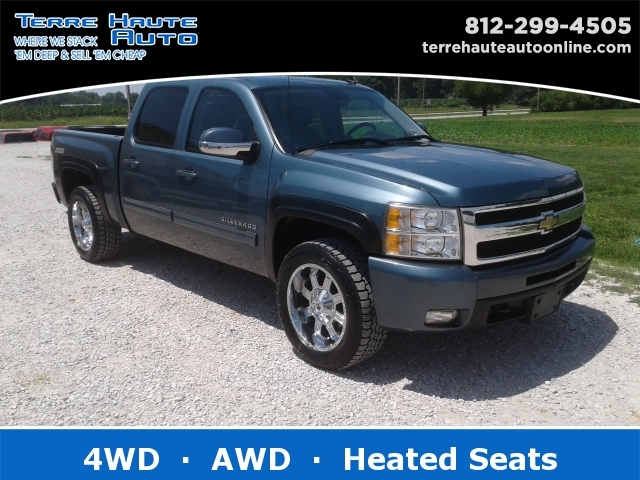 You will find this used Chevy 4x4 truck is loaded with comfort and convenience features. Like heated leather seats, an auxiliary power outlet, power door locks, and power windows. You will also find desirable features such as Bluetooth cell phone hookup for quick and easy hands-free calling and texting, steering wheel controls, and more on this used Chevy 4x4 truck for sale. This used Chevy 4x4 truck for sale also comes equipped with a powerful 8 cylinder, 5.3-liter engine that boasts an impressive 315 horsepower. So, make your way to the Terre Haute used car dealership, Terre Haute Auto, and take a used Chevy 4x4 truck for sale out for a test drive today. From helping you choose the used Chevy 4x4 truck for sale near you that fits your lifestyle to helping you obtain financing, you can count on Terre Haute Auto to be here for all your used truck needs. Call today to schedule an appointment for a test drive at 812-299-4505. You can find Terre Haute Auto located conveniently at 13350 S US Hwy 41, Terre Haute, IN 47802.